Inlays are indirectly fabricated dental restorations for the repair of chipped or decayed teeth. Indirect fabrication means that the tooth is prepared for the inlay, an impression (mold) of the prepared tooth is made and poured in dental stone, and the restoration for the tooth is made in a laboratory on the stone replica rather than the tooth itself. The inlay is then glued (luted) into the tooth, generally at a separate appointment. Inlays can be made from composite resin, gold and other metals, or various ceramic materials. Inlays are typically prescribed when it will be difficult to restore a tooth to its proper shape and re-establish proper contacts with the adjacent teeth. 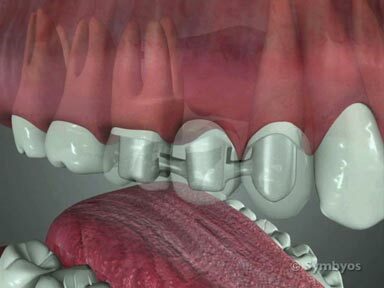 Less tooth structure is removed than would be necessary for crowns or onlays. Inlays are very similar to fillings, except that they’re usually made in a lab, which adds to the cost and complexity of the procedure. Some dental offices use Computer Aided Design and Computer Aided Manufacturing (CAD/CAM) technology to create restorations like inlays, onlays, and crowns right in the dental office. This avoids the need for a temporary restoration and a second appointment to place the restoration. While more convenient for the patient, dental CAD/CAM can often not produce the same results that a dentist working with a dental lab can produce. You dentist will likely prefer one method over the other – and some dentists may use both solutions. Digital impressions are now available in some offices, which allow a computer model of the prepared tooth to be generated. Data can be forwarded to a computerized milling device in a laboratory (or in the provider’s office), and the inlay can be made without the need for a traditional impression or second appointment. When you have an inlay procedure done, your dentist will review your health history. If you have replacement joints, such as a knee or hip, you may be pre-medicated with antibiotics for the procedure. If you have certain types of heart murmurs or replacement heart valves, you may also need to take an antibiotic pre-medication prior to the procedure. If you are anxious about dental procedures, your dentist may recommend sedating you for the procedure. There are several methods of relaxing patients for dental treatment, including oral anti-anxiety pills; inhaled anti-anxiety medication like nitrous oxide; and intravenous anti-anxiety medication. On the day of the treatment, your dentist will generally review the procedure, its risks and anticipated benefits with you. Ask any questions you may have ahead of time. Understanding the procedure, and any options you may have will lead to the best possible treatment outcome. A dental team member will frequently apply a topical numbing gel to the anesthetic injection site, to help reduce injection discomfort. Ask for it—it really does help! Sometimes inlay preparations can be accomplished without any anesthetic. You should discuss that with your dentist. If local anesthetic is administered, you will generally feel just a slight pinch, if anything. After that, the area will begin to tingle, and then “go to sleep”, normally for a couple of hours. Injections for lower molar teeth can produce a bit more discomfort, because the nerves to be numbed are deeper under the skin. Once the tooth or teeth are numb, the dentist or dental assistant may isolate the area with a rubber dental dam. Although these are sometimes awkward to place, they can enhance the procedure and the treatment outcome greatly. 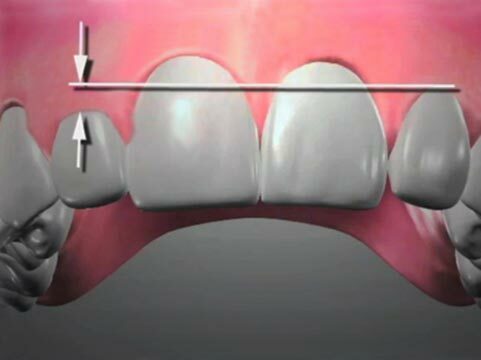 Rubber dams prevent the patient from having to swallow bacteria-rich decay and any old filling material. They protect the tongue and cheeks from injury by dental instrumentation. You can think of rubber dams as a surgical drape. Patients often express concerns that they won’t be able to breathe or swallow if a rubber dam is used; however, neither is the case. In some patients, use of an external nasal dialator strip may provide more comfortable nasal breathing. When good isolation is achieved, the dentist will remove the tooth decay with a dental handpiece. The goal is to remove bacterially infected and weakened tooth structure. Different techniques can be used to achieve the same goals, depending on the dentist’s training and treatment philosophy. When all of the obvious decay has been removed, and the preparation shape has been idealized to allow for insertion of an inlay, the dentist may use a caries detection dye, which will leave stain on areas of less obvious decay. It helps the dentist remove all of the decay without removing excess tooth structure. Some dentists may use a cavity disinfecting solution like chlorhexidine, which can kill tooth bacteria and help remove tooth cuttings known as smear layer. 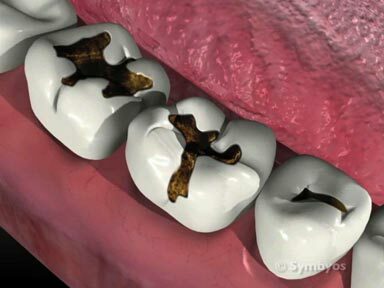 If the cavity is deep, the dentist may apply a base layer or liner to insulate or medicate the tooth pulp. Some dentists use desensitizing varnishes. An impression of the inlay preparation will be made, so that a stone cast replica of the prepared tooth can be produced. An interocclusal record of the way your teeth fit together will be obtained, using a fast-setting, elastic bite registration paste. If the inlay is to be made in a laboratory, a temporary filling will be placed in your tooth. If the inlay is being made in-office, you may be asked to wait while the inlay is being made. At the final inlay delivery appointment (if there is one), you may be re-anesthetized to prevent sensitivity. Temporary filling material will be removed, and the inlay will be bonded or traditionally cemented (luted) into the tooth. Your bite may be adjusted a minor amount to prevent heavy forces on the new restoration. Help us improve ToothIQ - take our one-question survey! What is MOST IMPORTANT to you when choosing a dentist? Thank you! This page was last updated on December 17, 2018. (Optional) Do you live in the United States? (Optional) Which state do you live in? © 2008 - 2019 Symbyos. All rights reserved.